356 pages | 26 B/W Illus. 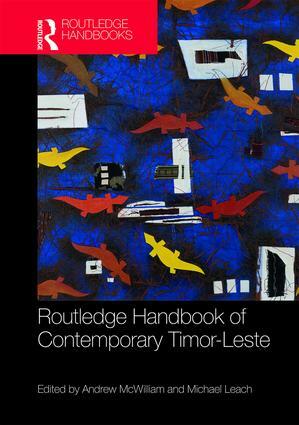 Reflecting on the legacies of Timor-Leste's remarkable journey from colonialism to sovereign and democratic Independence, the Routledge Handbook of Contemporary Timor-Leste provides a comprehensive and up-to-date reference work on all aspects of life in Timor-Leste. Written by an international team of experts, the Handbook covers the principle concerns that have contributed significantly to the shape and character of contemporary Timor-Leste. It offers a timely and valuable reference guide for students, scholars and policymakers with an interest in International Relations, Southeast Asian Studies and Peace Studies. Andrew McWilliam is Professor of Anthropology at Western Sydney University, Australia. He is a specialist in the anthropology of Eastern Indonesia and Timor-Leste. He is co-author of Property and Social Resilience in Times of Conflict: Land, Custom and Law in East Timor (2012). Michael Leach is Professor of Politics at Swinburne University of Technology, Melbourne, Australia. He has researched and published widely on the politics and history of Timor-Leste and is the author of Nation Building and National Identity in Timor-Leste (Routledge, 2017).